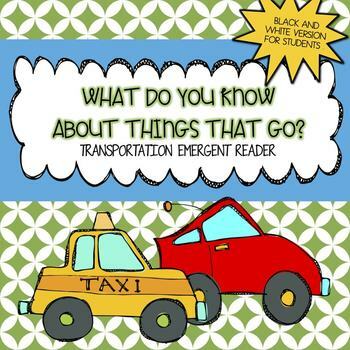 This book was created to go along with a transportation theme. This black and white version can be used and colored by individual students. 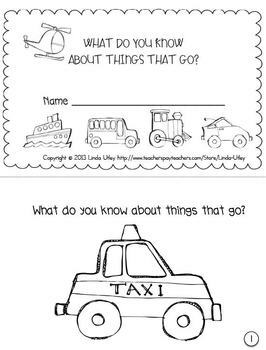 This original rhyming story is a fun way to teach students about all different kinds of "things that go." 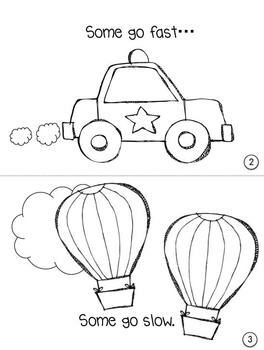 It includes: cars, train, plane, boat, hot air balloon, truck, taxi, school bus, rocket etc. This product prints onto 7 pages which are then cut in half to create a 14 page booklet. SEE MY STORE FOR THE COLOR VERSION FOR TEACHERS and A BUNDLE CONTAINING BOTH COLOR VERSION AND BLACK & WHITE VERSION.